South Point Hotel Casino Spa's gaming amenities include more than 2,270 of the most popular slot and video poker machines featuring ticket-in, ticket-out technology. The casino pit features over 60 table games including 21, Craps, Roulette, Fortune Pai Gow Poker and Three Card Poker. A freshly designed Race and Sports Book features over 300 seats with separate viewing areas for horse and sports action. The Del Mar Lounge provides the perfect place to grab a beverage and watch the action. The bingo room has 600 seats and features Cash Ball and the Progressive Double Action Jackpot. There are 8 Bingo Sessions Daily. Each Session Has It's own Cashball Jackpot. Twelve Games of Bingo Played Per Session. And there's a progressive double action game with a $25,000 bonus coverall in 50 numbers or fewer offered every session. Complimentary beverages are also given every session. 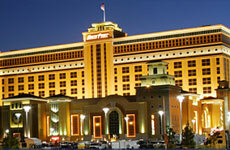 Furthermore, The South Point Hotel and Casino has a 24 hour, 11 table non-smoking poker room. It offers all of the most popular poker games and a variety of betting limits. Games featured are $2-4 and $4-8 Limit Texas Hold'em, and $1-2 and $2-5 blind No-Limit Texas Hold'em games feature full blinds and half-kills, with the exception of No-Limit. 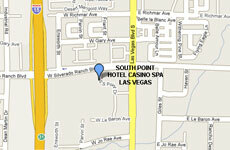 South Point Hotel Casino Spa provides a player tracking system for comps and a daily "high hand" promotion. Watch your favorite sports event on our state of the art plasma television screens. South Point also has a spacious Race and Sports Book area which features over 300 seats; 180 of those seats are equipped with tv screens for our horse players. Earphones may be purchased if you wish to hear the horse racing audio. The adjacent Del Mar Lounge provides the perfect place to grab a beverage and watch the action. The South Point's spacious Sports Book features multiple plasma televisions, over 100 seats as well as additional seating in the Del Mar Lounge, which is adjacent to the area. This high end amenity offers high limits and a gigantic wall-sized big screen television. The race and sportsbook is open 24 hours a day, 7 days a week.